Mens shiny dress shirts provide the man who likes to dress in a stylish manner a viable reason to look his best simply by shining in a way that you could never muster by wearing an ordinary shirt. These white shiny dress shirts are the way to make a mundane looking suit look like it's something special because the shininess of the dress shirt has a way of high lighting the style and fabric of the suit. Looking for any alternative to your old school style pleated tuxedo shirt, a satin shirt is the Tuxedo shirt for the new school. 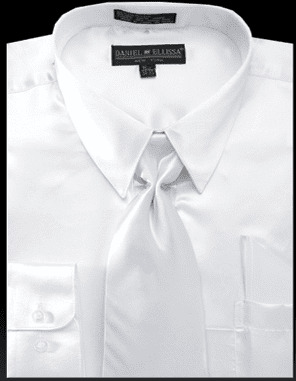 This Shiny white satin dress shirt for men comes with the matching Tie and pocket square which will show everybody that you know how to dress. Many people who are looking for a white silk shirt for men are really looking for a Shiny Silky satin shirt.The shirt runs to size. Do your James Bond thing by wearing a Tuxedo to your next formal event. See what styles are available in the world of Mens Suits. Keep your feet in fashion with Stacy Adams Shoes. If you like to go exotic with your shoes, try Belvedere Shoes.